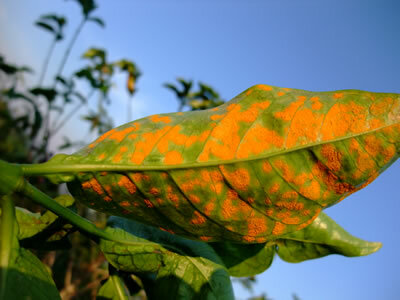 Costa Rica will lose at least 18% of its coffee harvest to coffee rust – Atlantic Specialty Coffee, Inc.
How coffee rust gets its name – this is a coffee leaf infected with the fungus. June 12th, 2013 (InsideCostaRica.com) Deputy Minster of Agriculture, Xinia Chaves said in a press conference yesterday that the latest forecasts indicate that Costa Rica will lose at least 18% of its coffee harvest to the fungus known as “coffee rust” in 2013-14, exceeding the forecast of 10.5% earlier this year. Experts calculate that Costa Rica will harvest 1,841,532 bushels of coffee in 2013-14, versus 2,246,521 bushels in 2012-13. A bill that would create a $40 million trust to help small coffee farmers is currently in the hands of lawmakers. The funds would be provided to farmers who produce 50 bushels or less per harvest, which represent 81% of the 52,000 coffee producers in the country. Together, these farmers produce around 25% of Costa Rica’s coffee crop. Coffee farmers both in Costa Rica and throughout Central America are dealing with the coffee rust outbreak, in addition to weak international coffee prices.